Hiya, Chanda here! The crazy holiday season is over and I’m already getting revved up for the next holiday….VALENTINE’S DAY. So, of course, I hit the Pinterest hard…I love, love, love all the beautiful ideas at my fingertips. So many creative people all over the world, aiding and sparking creativity everywhere. 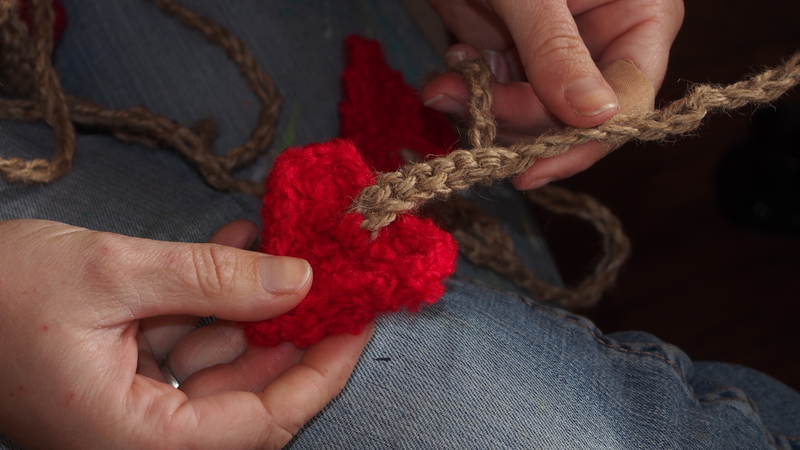 In my hunt for a cute Valentine’s Day project I spotted A Foothill Home Companion‘s tutorial for a crocheted heart. It looked so cute and, better yet, simple. LOL, she even timed herself at 6 minutes a heart. 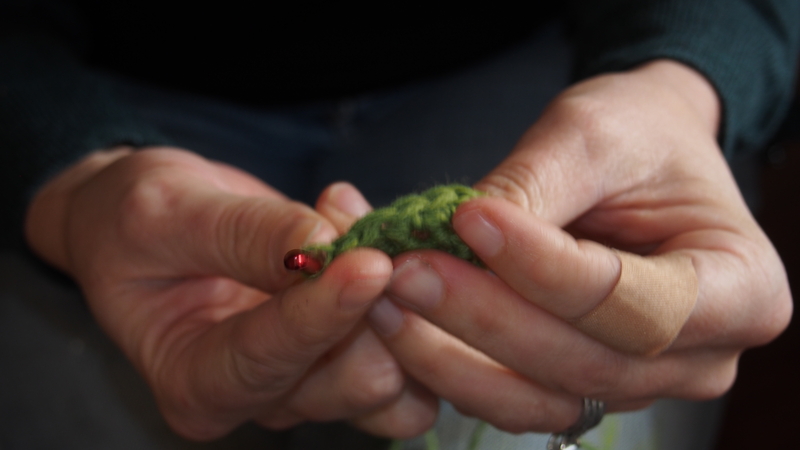 Ahhh, a perfect quickie project to start using some left-over red yarn from when I made my dad’s Christmas blanket. Now, let’s break it down, just in case reading patterns is daunting for any of y’all. 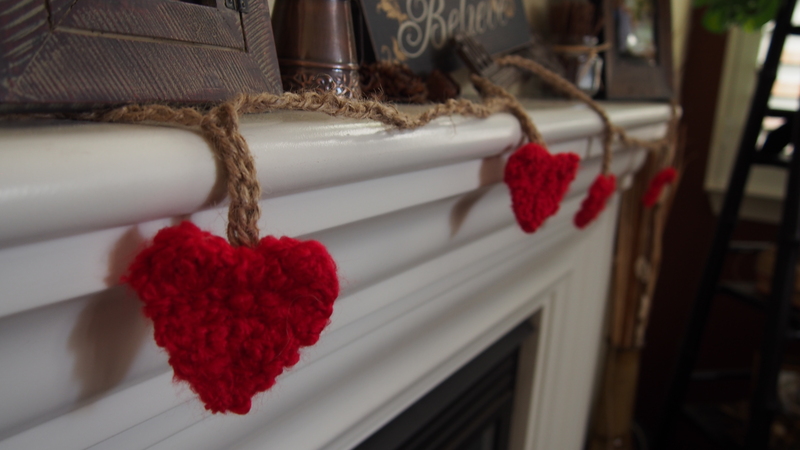 Obviously, I used a fuzzy red yarn for the hearts on my garland, but I took pix with a simple green cotton yarn….a way better visual. 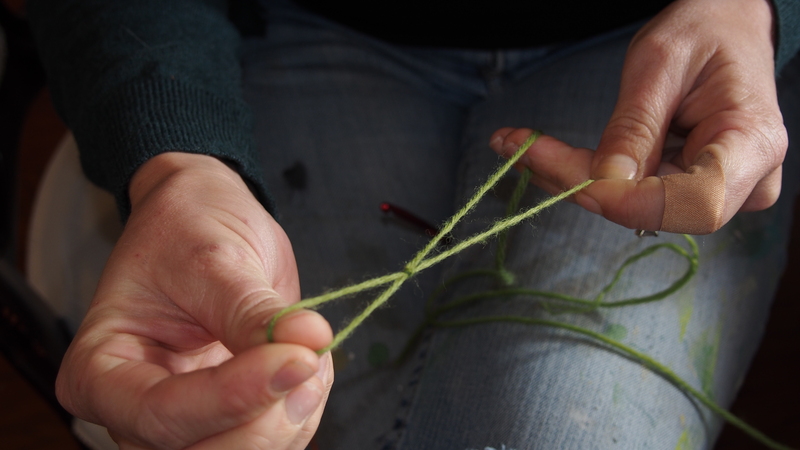 Start by doing a slip knot in your yarn. 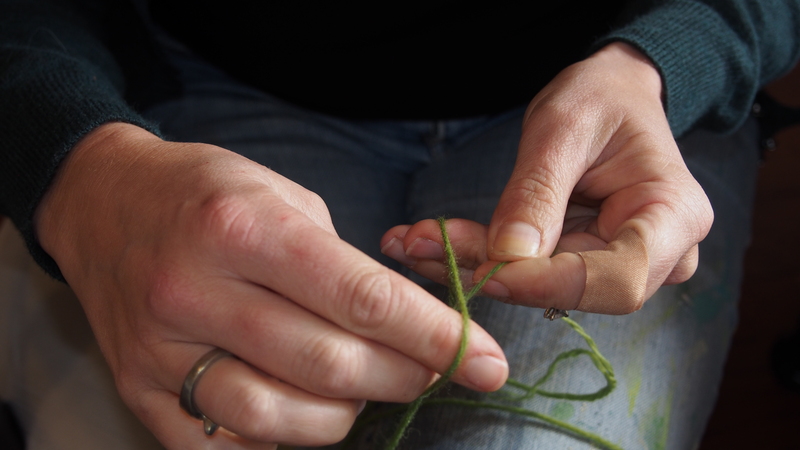 Now, make two chain stitches. 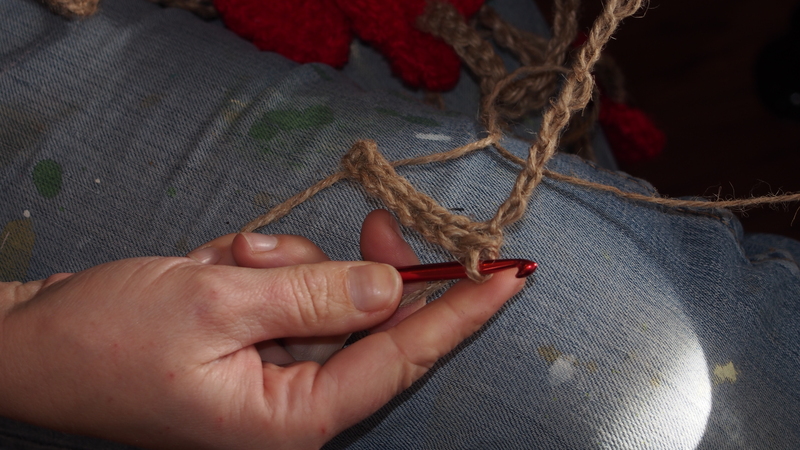 Do three single crochet stitches in the first chain. And then make one chain. 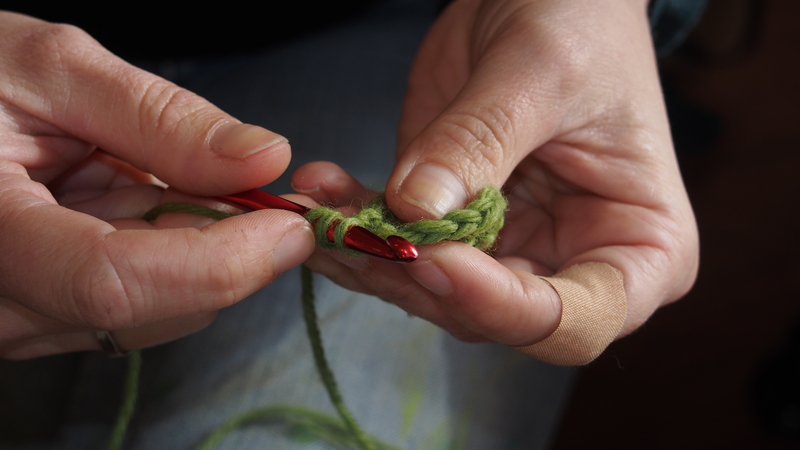 Turning the piece, make a single crochet in the first stitch, two in the second and one in the third. Make a chain. 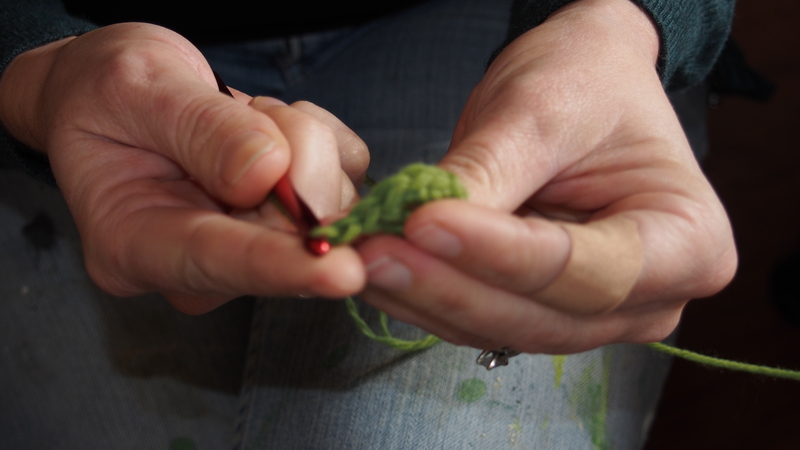 Thanks to doing two single crochets in that second stitch, the piece is beginning to widen. 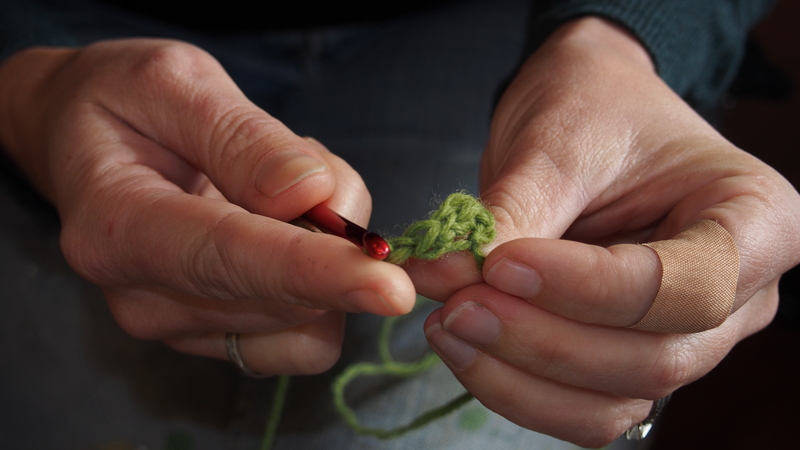 Now, turn the piece and make a single crochet in the first stitch. 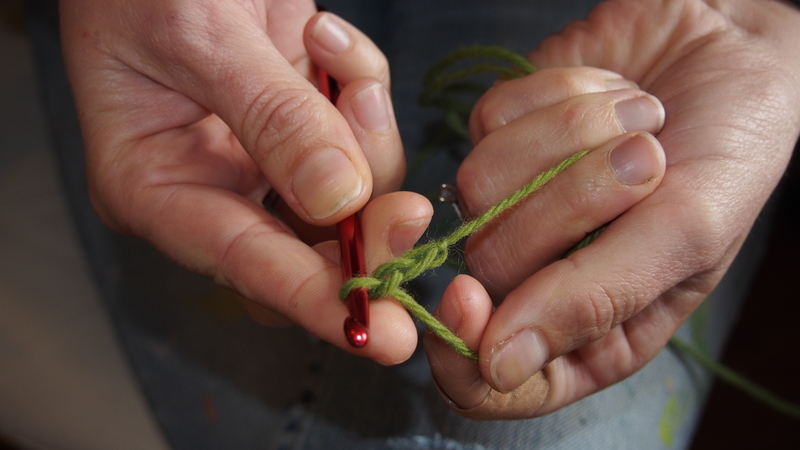 Make two single crochets in the second and then one single crochet stitch in each remaining stitch. Chain one and then turn. You repeat this concept, one in each stitch except for the second which gets two…until you grow your piece to seven stitches. It’s time for the humps of my heart. 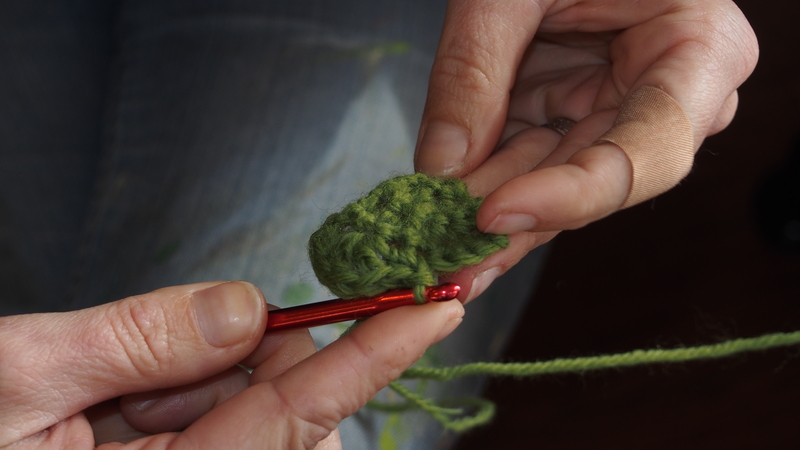 Do a half double crochet in the first stitch. 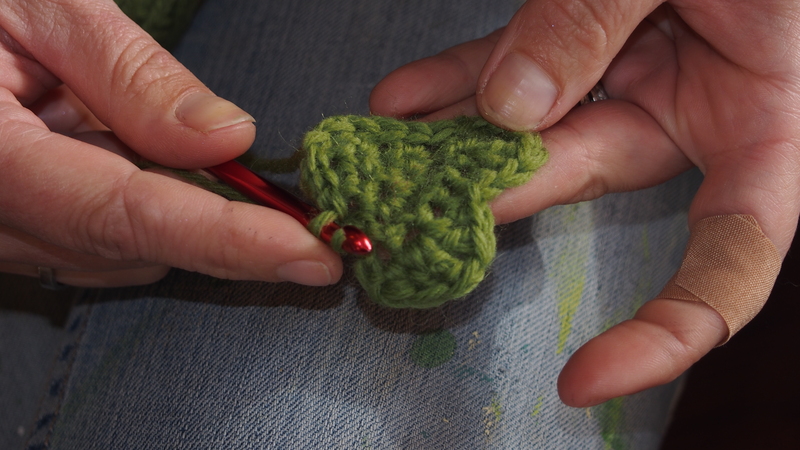 In the next stitch, make a double crochet, a triple crochet, and one more double crochet. 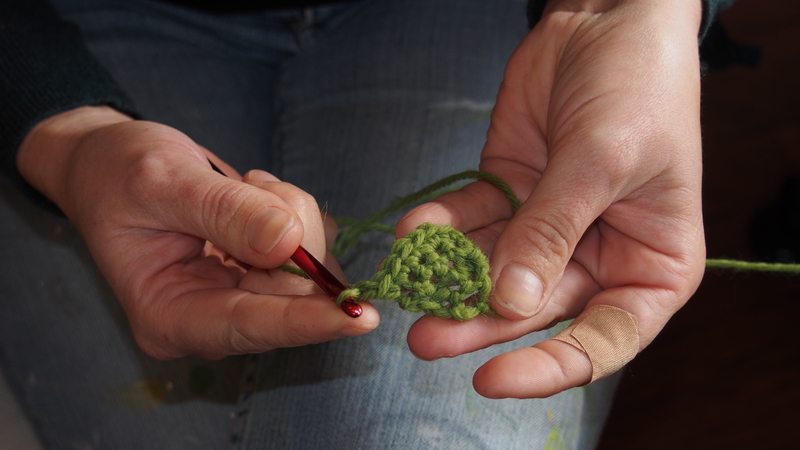 Follow this with another half double crochet in the next stitch. Do a slip stitch in the next stitch, one hump complete 🙂 Now repeat. A half double stitch in the next stitch, then hit the next stitch with another double stitch, triple stitch, double stitch combo. 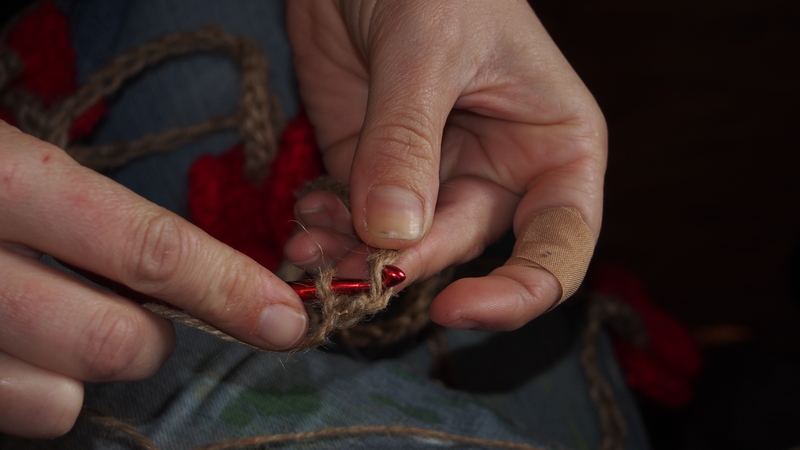 Do a half double stitch in the last stitch. 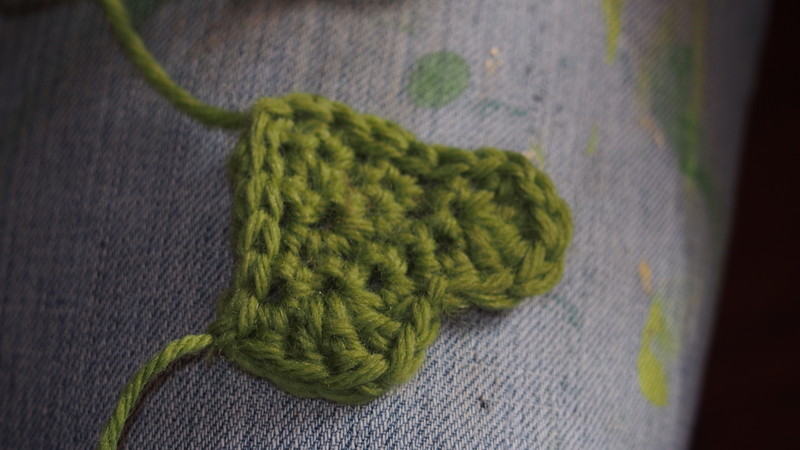 Now do six single crochet down the side of your heart, one chain, and then six more single crochets up the other side of your heart. Tie off. 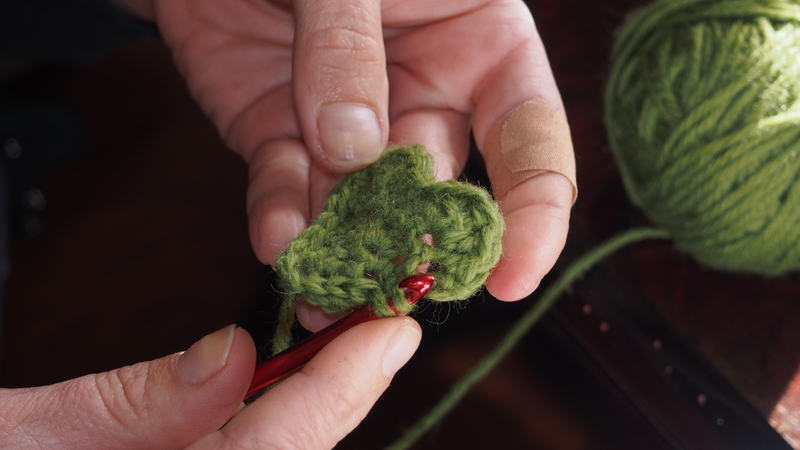 Cute as a little green heart, but I love my red hearts cuz they turned out so dense and fuzzy that they automatically look felted. 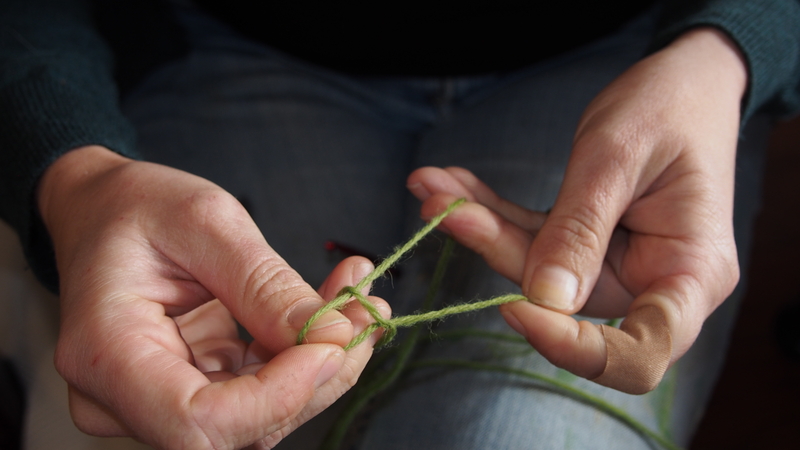 Now time for the twine garland strand. I used just a some twine jute that I picked up at Ace Miner’s for a buck n’ change. I started by doing 31 chains. 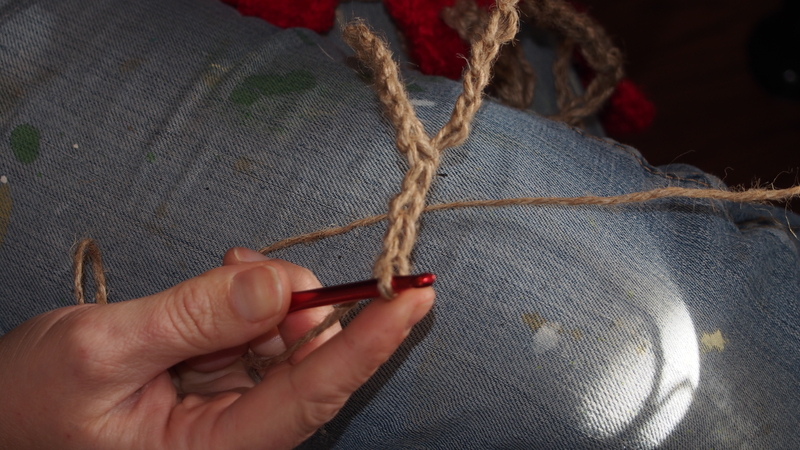 Then I turned it and did a slip stitch in the second chain from my hook. 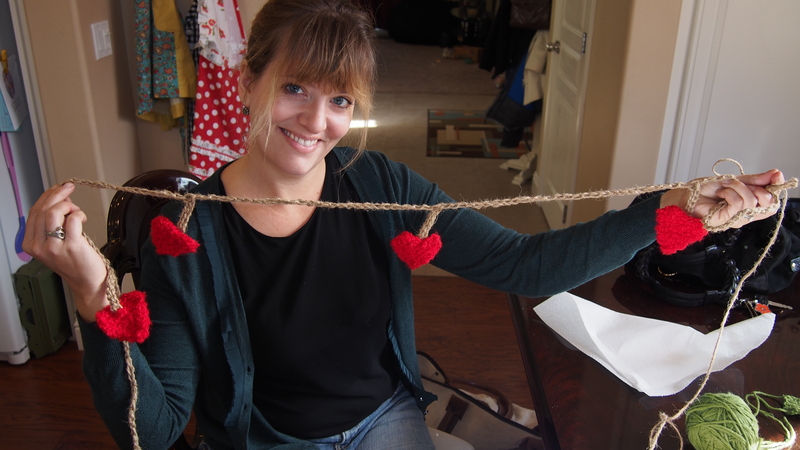 I did a slip stitch in the first seven chains to make the little dangle where I would attach my hearts. Then I chained 31 more stitches and repeated until I had enough hanging do-dads for my hearts…super technical, I know. 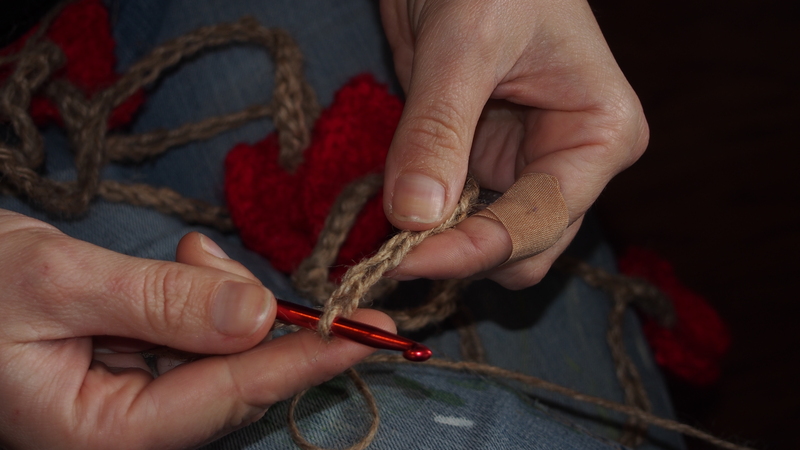 In the end, it’s simply a matter of attaching the hearts, which I did here by sewing it with my red yarn. 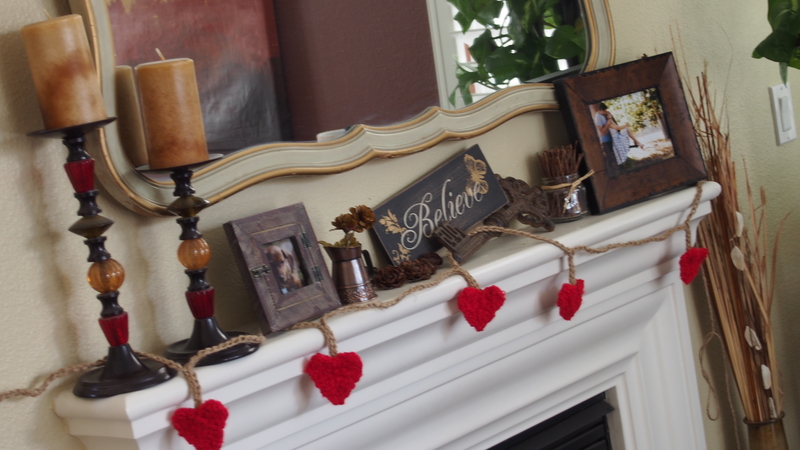 This first garland I made in one evening…super cute and quick…yay! For this first one I made 5 hearts…but you can go on and on and on…this could be a super cute touch for a wedding garland in any color scheme! Imagine it draped from a barn wall, a cake display, or adorning the alter…..so cute! Happy early Love Day 🙂 and thanks for checkin’ in on what we have been zestin’ up.